For the past couple of years, I’ve bought our Halloween candy purposely looking for the boxes that have peanut butter cups in them. Then, and I don’t know how it happens (ha! ), but 3 or 4 days later, all of the peanut butter cups are gone!? So, I have to go out and buy an extra bag or two of just Reese peanut butter cups on their own. You know, so we don’t run out and all. 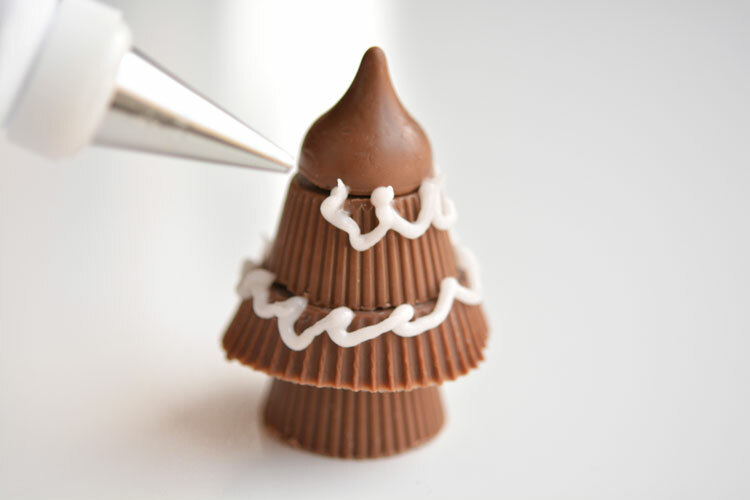 The whole time I was making these peanut butter cup Christmas trees, I was pretty much drooling. 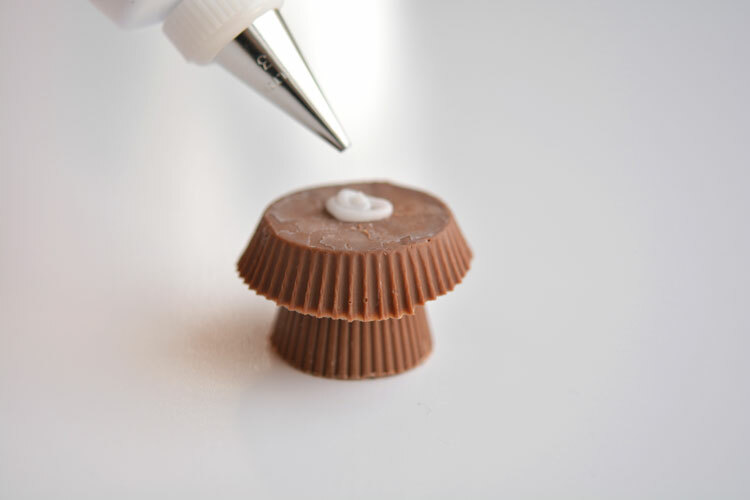 Before you get too far though, I have to warn you that you need to have the proper sizes of peanut butter cups. I started by buying the Reese mini peanut butter cups, but they were all wrong. 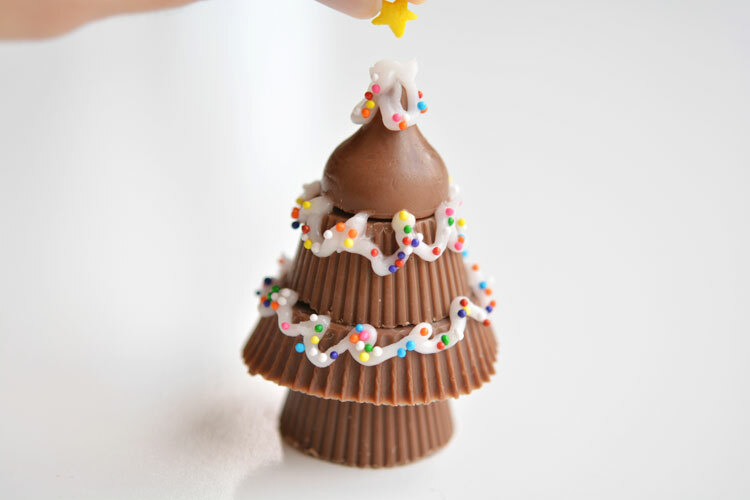 I set up everything to get started, and when I put them together with the Reese minis, my trees looked ridiculous. Ugh! There’s nothing worse than having to stop a project to run to the store! 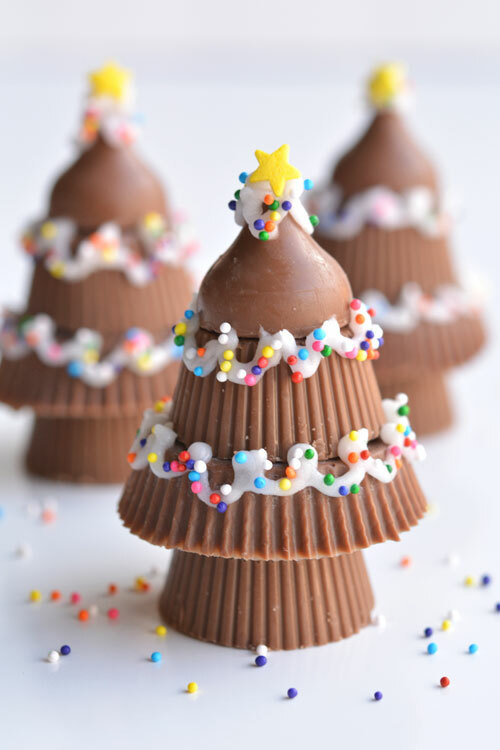 So the foil wrapped peanut butter cups, are NOT Reese brand, but they worked perfectly for the size of these trees. I also picked up the super cute star sprinkles while I was on my emergency trip to the store, so at least my trip was worth it. When I got back home, my three year old little helper was so excited to snack on the non-yellow star sprinkles that I had no use for. Then she stood around my table as I was making the little trees, and every time I looked away, she’d rush in, press her finger on as many of the tiny ball sprinkles that had fallen onto the table as she could and she’d pop them into her mouth before I turned back around. And then I’d have to add a few more back onto the table for the photos. I think she thought I didn’t see her. Little rascal! I wish I could take the credit for coming up with this all on my own, but I got the idea from Sweet Simple Stuff. She used white candy melts, which I kind of think is a bit more work, but hers still turned out looking amazing, so you should definitely check them out. 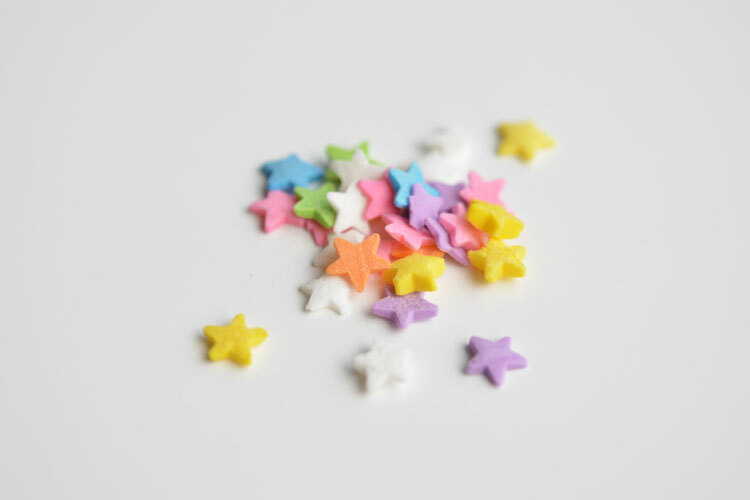 I’m loving these star sprinkles! I got mine from the bulk store – which I love, because I didn’t buy many more than what you see in the picture. If you can’t find them at your bulk store, you can also order them from Amazon. 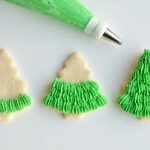 I LOVE using Wilton’s Decorating Icing for these kinds of things. You could use melted white chocolate candy melts too, but the price would probably work out the same. And this is seriously SO MUCH EASIER! 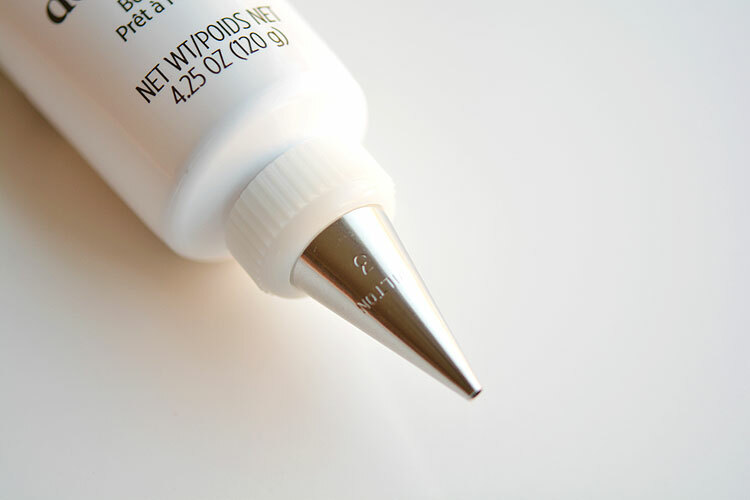 I used Wilton decorating tip #3 with a decorating coupler and it just screws right onto the tube. Seriously. So easy! Unwrap one of the mini peanut butter cups and place it upside down. 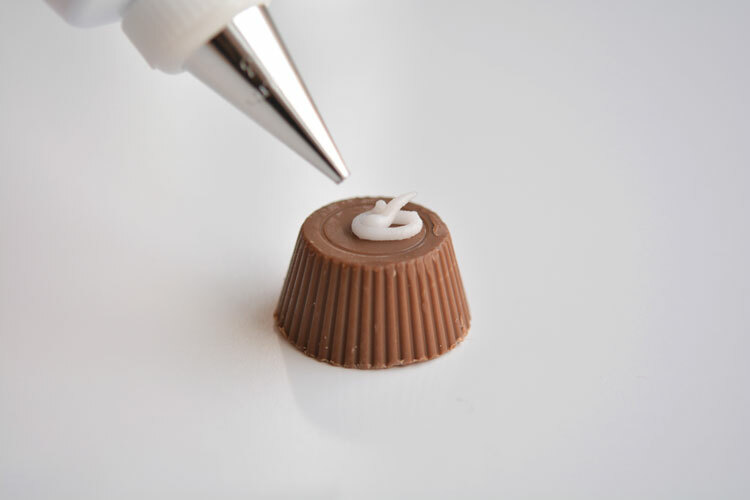 Add a generous amount of icing (more than I’m showing in the photos), and then press a Halloween sized Reese peanut butter cup upside down on top of it. I think the Halloween sized ones are slightly smaller than the regular ones, so they fit really nicely without a size gap. 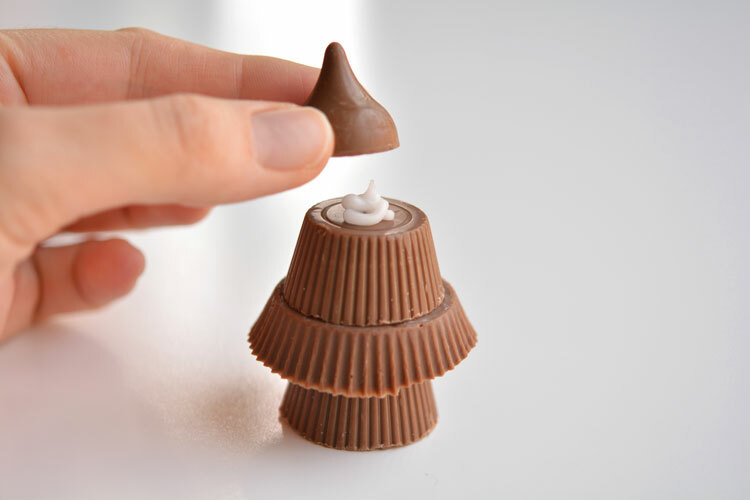 Place another upside down mini peanut butter cup on top, and then top it with a Hershey’s kiss. It amazed me that the sizes formed a perfect little tree! And now for the fun part – Decorating it! You’ll have to excuse my messy lines below. I was busy taking photographs and I didn’t notice how crooked everything was until it was too late. The sprinkles pretty much hid the crooked lines, but it does look a bit messy below. Oops! 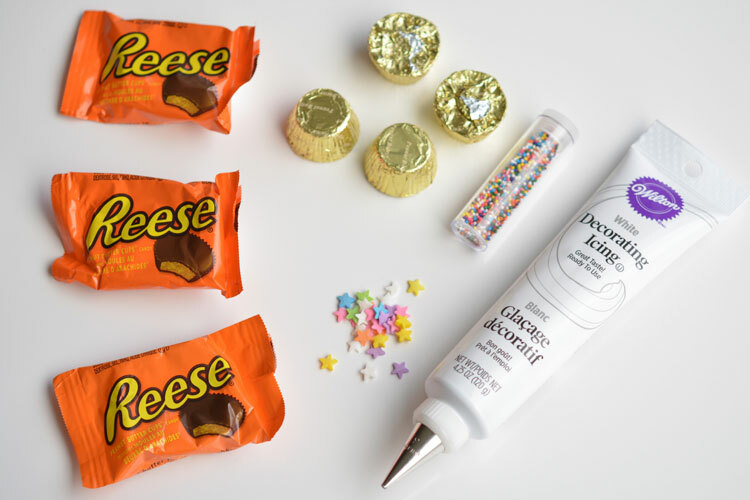 Then add your sprinkles and top it with one of the mini star sprinkles. I really love how the star finishes it off! 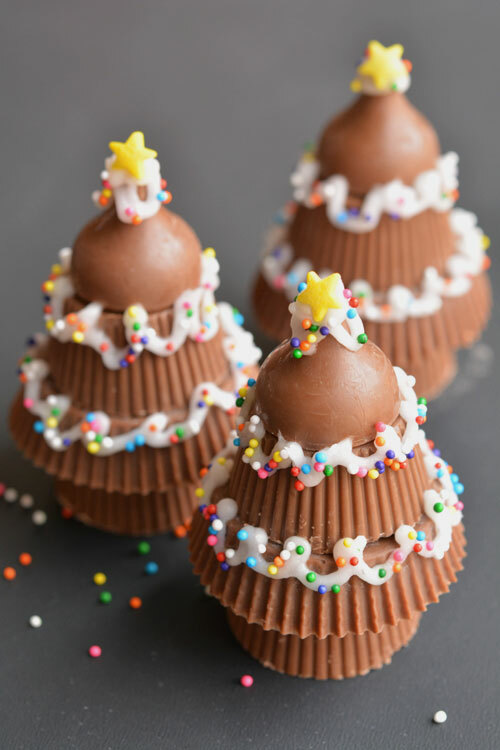 You can make these as easy treats, or you can wrap them up in clear cellophane and give them as a little gift or party favour. 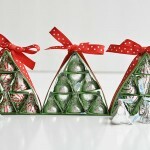 If you do plan to wrap them up, it’s probably safer to use white candy melts instead of the icing. The icing hardens, but not to the point that I’d trust putting a bag over top of it. Can you believe how easy these are?! 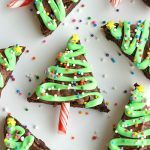 You can whip them up so quickly! I found the most difficult part was getting the sprinkles to stick to the icing. I would sprinkle over top, and they’d all fall off. I had to resort to pressing a lot of them on with my finger. It wasn’t the end of the world or anything, but I wanted to let you know, you aren’t crazy if you have the same problem. 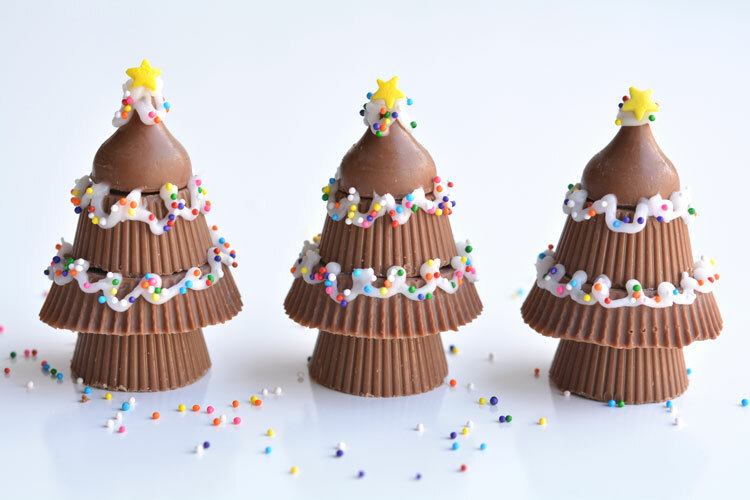 These peanut butter cup Christmas trees are SO CUTE! They go together really quickly and look absolutely adorable! 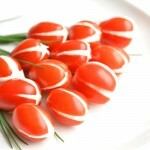 They’d make a great dessert or snack at a Christmas party, and can even be wrapped up to give as a gift or party favour. Wait! 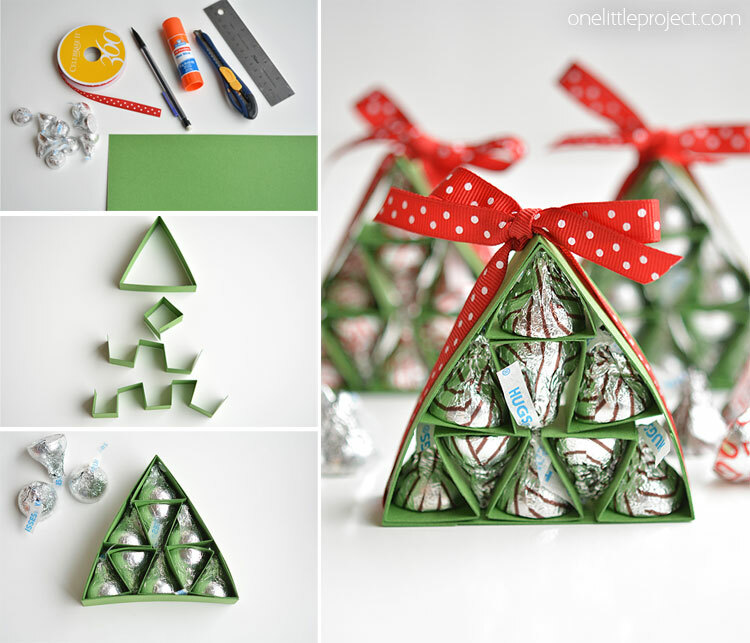 Before you go, check out our other popular Christmas ideas and save them to your Christmas Pinterest boards for later! These are so adorable! I’m not a fan of peanut butter cups but these look awesome. 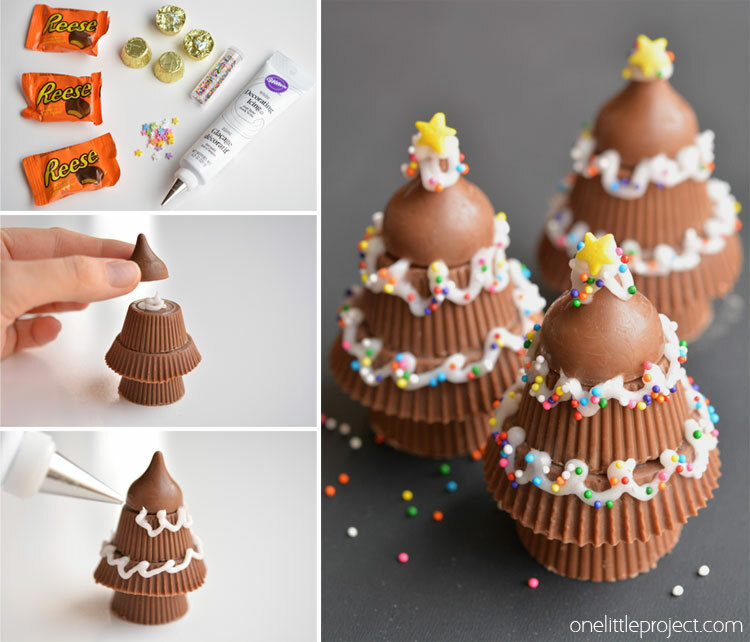 And my kids like peanut butter cups so these Trees will be on our list of things to do this Christmas Season! !